The Science Council is pleased to announce that the Biochemical Society has been welcomed as a full member organisation. This was ratified at the Annual General Meeting held on 14 June 2016. Biochemistry and molecular biology has previously been underrepresented within the Science Council, so their membership contributes to our representation of scientists across sectors and disciplines. The Biochemical Society will be working towards offering Science Council registration to their members, through co-licensing with the Royal Society of Biology. 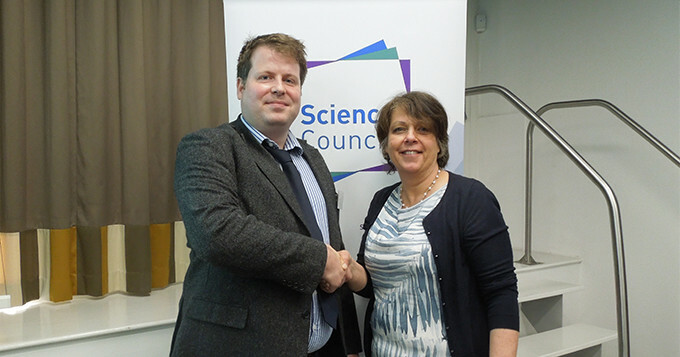 Photo: Adam Hughes, Head of Group Projects and Governance at the Biochemical Society with Belinda Phipps, Chief Executive at the Science Council.